All in all this game was fairly mediocre. It did not play up to its name as much as it could have and, despite playing it in one of the VegasMaster teams collective favourite casinos, there were no bonus plays or features of note available. This game takes forever to load but, once it is up and running you are bound to expect a mystical time. Complete with eerie music, the graphics are supposed to spin you into a trance like state of awe. There is no background music with this game, which detracts from the mood the messy graphics and symbols create. The voodoo there promotes witch doctors, alligators and a whole host of voodoo dolls and other mystical creatures from the beginning of time. With the torches at either end of the video reel, I keep expecting a mummy and tomb to pop out from somewhere. The voodoo dolls, in my humble opinion, were more cute than ominous and I would love to own one. The skulls seem funny rather than spooky. The elusive witch doctor obviously has no watch or sense of timing. 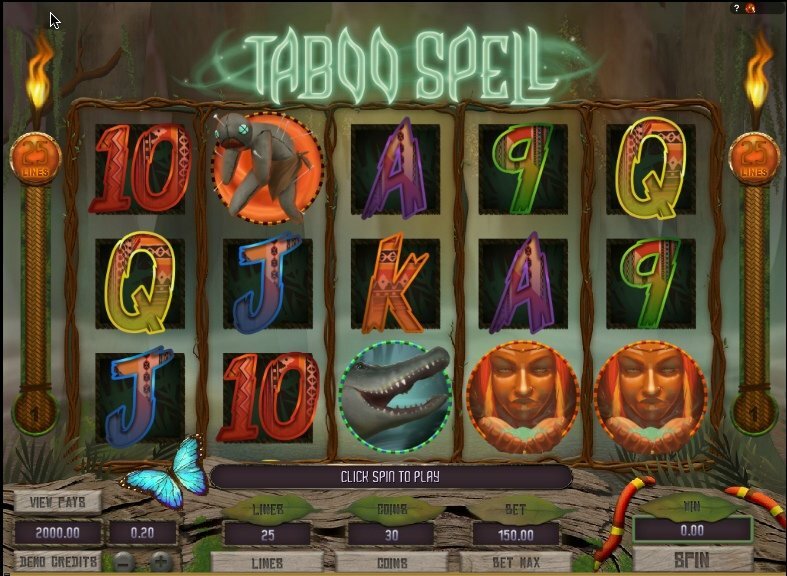 The Witch Doctor Free Spins are triggered randomly and, you will get 6 free spins with all Tiki masks, crocodiles and skull symbols changing into witch doctors for extra oomph. You can also trigger a further free 6 spins during one of your current free spins. 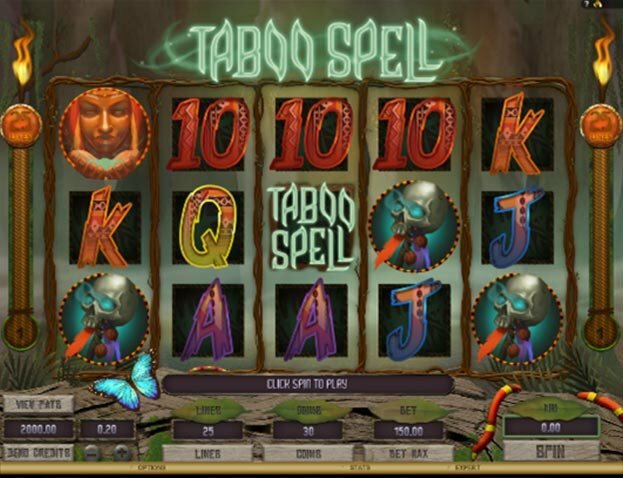 The blue butterfly at the bottom of the 25 x 5 reel Taboo Spell slot machine continues to be a mystery to me - it does not have any place in this realm and, it makes me suspect it is a spy from another time. The voodoo dolls, in my humble opinion, were more cute than ominous and I would love to own one. Disappointingly enough, getting 5 of a kind offered no bonus play or jackpot, there wasn’t even a free spin for me to take advantage of. The Witch Doctor was also hard to come by, perhaps he was in high demand elsewhere while I was playing? Just as I was about to give up, the music suddenly darkened and the elusive figure popped out to offer me my free 6 spins. 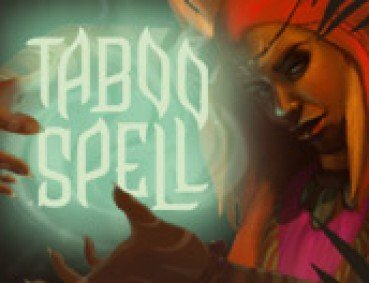 Taboo Spell seems to be lacking in magic potions of any kind, despite the dark theme of the graphics.